Signe Hebbe was an opera singer and a drama teacher of the 1800s. She introduced new romantic-realism stylistic ideal which remained dominant among several generations among opera singers and actors. She has been labelled the ‘Stanislavski’ of the North, albeit her contributions predated him by six decades. The first year of Signe Hebbe’s life was marked by the sudden uprooting of the family from their home at the Småland estate of Näsbyholm. Her father Clemens, of the Stockholm Hebbe merchant family, went bankrupt and fled to England, leaving his wife and three young daughters. They too were forced to abandon everything and rent a furnished home in Jönköping. Signe Hebbe’s mother,  (Wendela Hebbe), who was a well-educated daughter of a clergyman, was able to provide for her family by giving piano, singing, drawing, and language lessons. Signe Hebbe’s school attendance had an uneven start. She began by taking private lessons but then spent two years attending the Wallin school from age 11 onwards. She also attended Adolf Fredrik Lindblad’s piano institute and this led to her enrolling at the Kongl. Theaterns elevskola (royal theatre school) at the age of 12. In addition to this she was also a regular pupil at the Herman Sätherberg gymnastics institute. The birth of her half-brother and being sent to Berlin meant that she was forced to give up her studies before the final year. However, she then took singing lessons from Mendelssohn’s student Richard Wüerst at the private Conservatorium der Musik, whilst also learning German and how to draw. (Jenny Lind’s) four farewell concerts given in Berlin in 1854 became life-defining experiences for Signe Hebbe. She was also deeply influenced by the actress Johanne Luise Heiberg, whom she saw perform in Copenhagen. Once she had returned to Stockholm Signe Hebbe made her acting debut in 1855, which included appearing in two different roles at the Kongl. Theater. She continued singing lessons with Julius Günther, and, following an introductory year with singing teacher Jean Jacques Masset, she won entry into the Paris Conservatoire imperial de musique et de declamation. Her lessons were paid for by her step-father Lars Johan Hierta. Signe Hebbe was the first Nordic artist to be awarded a medal from the conservatory in 1858. During her econd and third year, along with an extra fourth year, she also attended lessons in recitation and even spent some time as a substitute teacher in ‘maintien théatral’, amongst other things, for students including  (Sarah Bernhardt). Signe Hebbe later extended her vocal range through the on-the-job instruction she received from Francesco Lamperti in Milan and, with the help of the Italian actors Adelaide Ristori and Ernesto Rossi, she also increased her dramatic expression. Further, she undertook role studies directly with the composers David, Thomas, Gounod, and Berwald (Fidelio). Signe Hebbe’s early career was hampered by difficult personal and professional circumstances. Her sister Fanny lost her husband and her child in Denmark whilst her sister Thecla died in Paris from tuberculosis, leaving a new-born son behind: Signe Hebbe’s American fiancé took part in the war in Georgia and the Hierta family no longer wanted to fund her living costs in Paris. On top of all this her theatre agent died and as a foreigner Signe Hebbe was treated with a lot of scepticism by the theatres. At that time students who trained at the Conservatoire for three years were contractually required to seek employment at French theatres. Signe Hebbe obtained a two-year contract in Lyon leading her, her mother and her half-brother to move to Lyon. As wages were only paid out following a debut performance and this was being blocked by a rival, Signe Hebbe broke the contract and made her stage debut in Frankfurt during the spring of 1862. She continued her career at the Mannheim royal court, where she mastered an extensive repertoire, including singing the part of Elsa in Lohengrin, for which she received acclaim from Richard Wagner. During the period of 1864-1879 Signe Hebbe frequently appeared as lead soprano at the Kongl. Stora Theater in roles such as Margareta in Faust, Valentine in Hugenotterna, Selika in Afrikanskan, Alice in Robert av Normandie, Fidelio-Leonora in Fidelio, Susanna in Figaros bröllop, Violetta in La Traviata, Marie in Regementets dotter, and Mignon in Mignon. While she was in full-time employment at Théâtre Lyrique in Paris, Signe Hebbe had to fend off rivalry from  (Christina Nilsson) and was never able to perform in the rehearsed roles of Myrrha in Sardanapalus, Donna Anna in Don Juan, Pamina in Trollflöjten, and Agatha in Friskytten. 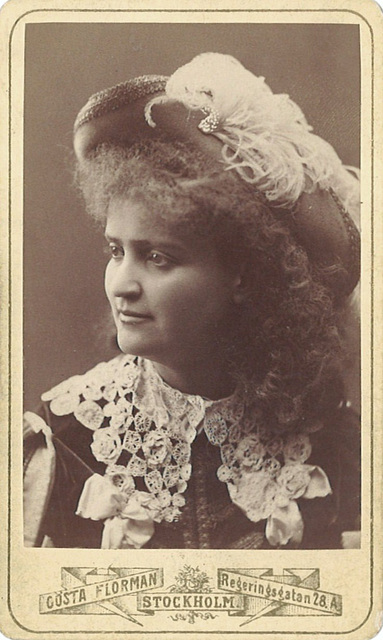 Signe Hebbe was a guest performer at several major European opera houses and made a particularly significant contribution in operatic art in Finland and Norway, especially under the leadership of Ludvig Josephson at Christiania Theater during the 1870s. She became well-known for her beautiful and well-polished voice which was not, however, equal to her forceful general dramatic expression. Her natural acting style, influenced by the French-Italian style, was considered alien in Germany and the North as it clashed with the rigid dominant traditions of those countries. Nevertheless in 1871 her expertise as a teacher was sought after by the Kongl. Stora Theater management. In 1879 Signe Hebbe’s opera career ended, partly due to the illness of her mother – whom she lived with. Signe Hebbe instead developed her teaching career and became the most sought-after singing and acting teacher in the North. Her work only intensified from 1883 onwards. She spent a few years as a state employee teaching at the music conservatory theatre school and at the Dramaten school, but then returned to giving private lessons. She also gave many free lessons to those who could not afford to pay. At this time the idea that singers also needed to master physical means of expression was novel. Signe Hebbe’s introduction of deep breathing became particularly important, which in turn led to freer arm movements and left the body open to all kinds of emotional expression. Her exercises involved thoughts first, followed by movements, and lastly words. Signe Hebbe also made an innovative contribution to enunciation and the art of phrasing, inspired by the French tradition. In her role analysis she gave the female roles in particular greater dramatic logic and meaning. Her teaching method came to form the basis for an entirely new operatic style in Sweden. It also became very important in Swedish silent movies, as many of the leading artists were taught by Signe Hebbe. Signe Hebbe demanded a tremendous work discipline of her students. Not all of them accepted the demands she placed on them. August Strindberg is said to have taken his wife, Siri von Essen, home when he decided that she was spending far too much time with Signe Hebbe. He felt she should have been taking care of her husband and her children. However, it is also apparent that he was influenced by Signe Hebbe’s approaches in his famous foreword to Fröken Julie. Signe Hebbe’s students included Matilda Jungstedt,  (Anna Norrie), Julia Håkansson, Gerda Lundequist,  (Hilda Borgström), Manda Björling,  (Naima Wifstrand), Tora Teje, Anders de Wahl, John Forsell, and Lars Hanson. Many of her students also went on to become teachers themselves, who in turn produced more teachers. The teaching styles can be traced through the Nordic theatre schools but also through the teachers and directors in Germany, Italy, Poland, Austria, Britain, France, and the USA. They were at their strongest until the mid-1960s. Ingmar Bergman, for example, often used actors from the ‘Signe Hebbe school’ for his films. Signe Hebbe died in 1925. She is buried next to her mother at the Norra cemetery in Solna. In 1937 Signe Hebbe street in Hägersten was named after her. Signe Amanda Georgina Hebbe, www.skbl.se/sv/artikel/SigneHebbe, Svenskt kvinnobiografiskt lexikon (article by Inga Lewenhaupt), retrieved 2019-04-26.